About to appear in SSB interview and looking for hot SSB group discussion topics and Lecturette Topics? Check out complete information on crime against women topic for SSB interviews and all other competetive exams. In the early 90's our planners decided to open up the economy. With liberalization and Globalisation, many MNC's entered the Indian Market, which brought a huge change on the economic front. Today there are large numbers of MNCs that are operating in Indian markets. They are present in almost every sector of our economy. Recently they have entered in the sector of outsourcing that is commonly called as Call Centers. MNCs have demerits and merits both on our economy, but with the changing scenario globally, they are the need of time. The consumer is one happy lot after the MNC's entered our market. Today every item from shoes to cars, from Pepsi to Me Donald's is available to them. The consumers have a wide variety to choose from. Take shoes for example. A few years back we only had Bata. Today we have Nike, Woodland, Red Tape, Reebok etc. the cost is very competitive and the quality has improved. (a) Negative Effect. Under the influence of globalisation, most developed countries, instead of controlling the activity of MNC's are inviting them to invest them in crucial sectors of their economy. Some feel that the rich countries are preparing as debt-trap for the poor countries. They provide poor countries assistance on the condition of introduction of liberalisation and globalisation, which makes a way for functioning of the MNC's. This increases the production of certain products, exports also increase but imports increase more than the exports and that leads to a balance of payment problem. At critical moments, foreign forces strike again, capital starts to fly, value of domestic currency starts falling. Again the international agencies come to help with more strict terms and conditions and the helpless country becomes a victim and gets into a vicious circle from where it is not easy to come out. MNC's come into any country with an aim of making profit. They invested heavily in the setting up a project. Some people feel that the MNC's multifold increase of their strength is looting the people of secular nations in the name of globalisation. They are also more powerful than any government on the earth. It is also feared that people in developing countries may have to leave their traditional professions and depend on the jobs and product created by the modem capitalist institutions. It is pointed out that MNC investment is limited essentially to the supply of second hand plant and machinery which is declared obsolete in their country. Conclusion. Ultimately nations have to depend on their own capabilities to achieve progress. Respect has to be earned through demonstration of independence, competence and clear sense of purpose. 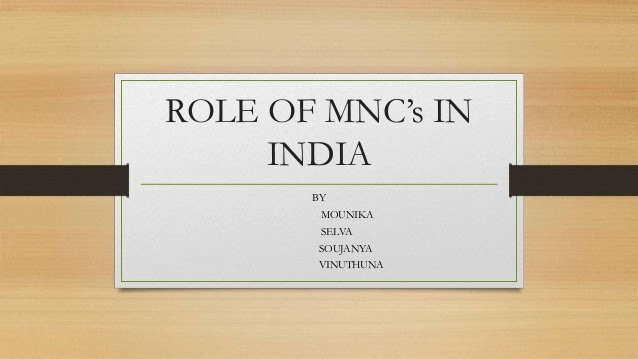 The MNC's cannot provide development by them. They can only provide helping hand to the process of growth. No Comment to " Who does the MNC's help the most - GD and Lecturette Topic in SSB "